Julie Nicaisse create eye-catching pieces by transforming organic shapes and curves into timeless wearable treasure inspired by the magnificent beauty and magic hidden in every aspect of Nature. There is dominant organic feel with a twist of dark elegance in all her creations, which reflect Julie’s admiration for the natural world and passion for history. 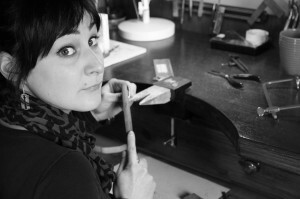 The Belgian born jeweller & designer began to learn the Art of jewellery making in 2006 in London. Julie acquire a high level of craftsmanship working for a numerous renowned jewellers before launching her own brand in 2017.